Bokkie Vink and his cymbalom are certainly the driving force behind this group. The cybalom is a kind of hammered dulcimer used frequently in east Europe and characterized both by tonality and rhythm, it is an inexhaustible fountain of productivity. At the high end there is the trumpet of Gijs Levelt, the true soloist of the group and between these two is the accordion of Theo van Tol who gels the group together harmoniously. 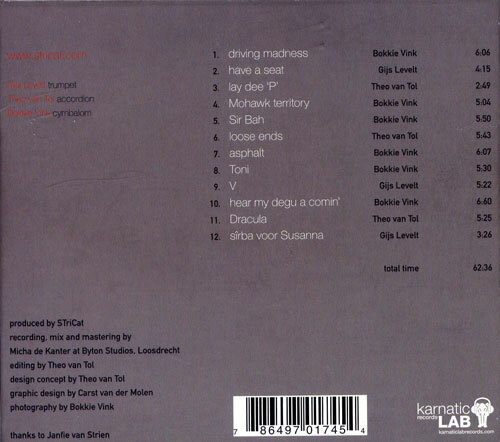 The base of their music is Balkan where fluid rhythmic patterns are exposed to the liberal arias from the region of Bimhuis in Amsterdam, a bed of European creativity. The result is very good as it avoids the usual risk of a patchwork of ethnic music that has been forced into a an unnatural amalgamation. The Stricats are always coherent and together and interesting because of the richness of their sound, incorporating jazz themes, a little bop, some klezmer and even a few James Brown riffs. All of this is so well put together that the result is truly new material. 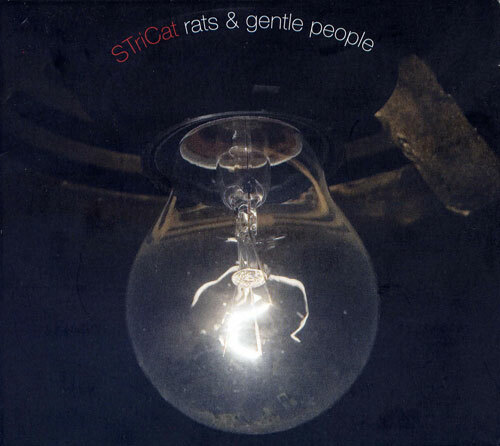 It has to be said that “ Rats and Gentle people “ that sticks in the mind and demands to be put back in the Cd player. When , a couple of the times, the tempo slows down however, it seems as if in a dream you are able to reach out and touch the music.